Now that we have your attention with such a controversial topic, we beg you to keep reading. We promise this will be a different take on a well-worn topic, and we have tried to make it somewhat entertaining. At least, we found it entertaining, and hope you will as well! We asked leaders from all parts of the country to weigh-in with their ideas, experiences, and stories on the topic. While by no means exhaustive, we thought this was a good start to help us explore a subject we all know a lot about, but for some reason always seem to need to know more! We took these replies, and came up with several different scenarios that lend themselves to a discussion on this topic. It is our hope, that by showing the good, the bad, and the ugly, we can help you understand that what you go through is not too dissimilar from what others experience, and help you to finalize your teaching teams for the upcoming year. IS THIS WHAT HAPPENS WHEN YOU ASK A GROUP OF PEOPLE IF THEY WOULD LIKE TO BE CATECHISTS? 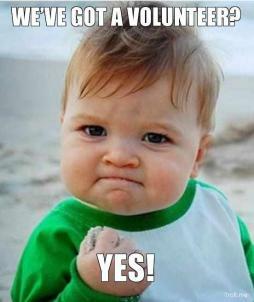 The first dose of reality we all experience is that people are not knocking down our door to volunteer to be catechists. Ever wonder why that is? These reasons, and others, are concepts we need to keep in mind as we talk to potential catechists and ask them to serve. We can and should put in place ways to overcome these common reasons for not helping to pass on the Faith. So, what are the ways people mention when asked how they recruit catechists? So, what was good about the last one? You asked people to consider being a catechist. You were, positive, upbeat and open. You let everyone know that all you expected from them is prayer. One of the most effective ways to recruit catechists is by having a one-on-one conversation. Through experience, this approach has been more effective than a bulletin announcement, or a plea made from the pulpit. There are many opportunities where this can occur. For example, when parents come in to register, ask them if they have interest in teaching or assisting. Attending Parish functions or being available after Mass is another way to recruit catechists. Making yourself visible to the community can prompt a conversation about becoming a catechist. Be there, and ready to share! A. They involve the parents in the faith education of their children. Research shows that when a parent is involved in a child’s religious education, there is a much greater chance that the child will be a practicing Catholic when they are adults. B. They offer a substantial opportunity to catechize or re-catechize many of the adults in your Parish. Many feel uninformed or are actually misinformed about the Catholic faith, and this provides an opportunity to give people the background they need to be able to lead their children to Christ. C. They provide a large number of adults that you can recruit from to teach classes, after they see how important it is to hand on the faith to our kids! Confirmation need not be the sacrament of exit. Help the teens in your Parish live out their faith by inviting them to help with teaching or assisting. 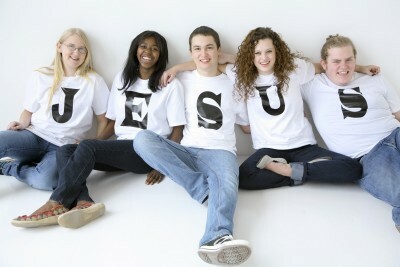 Most teens love Jesus – we can give them ways to show it by helping teach the Faith to others! OK. Enough. Let’s forget the good, the bad, and the ugly – let’s now concentrate on the true, the good, and the beautiful. Luke 5: 1-9 The Apostles had been out all night and to no avail they returned empty handed and discouraged. We too can be discouraged when casting out our nets for souls. We also cast our nets in need of effective catechists and teachers who can pass on a living faith, a faith that will resonate in the hearts of children. If we look closely at the work of Raphael along with Scripture and the Catechism we are reminded of God’s role in all of this. The Catechism of the Catholic Church states that, “faced with God’s fascinating and mysterious presence, man discovers his own insignificance” (CCC 208). In this painting Peter, humbly kneeling before Jesus, clearly has realized how insignificant his futile attempts had been. St. Luke tells us that Peter was “astonished”. So astonished that he says to Jesus, “depart from me for I am a sinful man, O Lord” (Luke 5:8). When will we realize our own insignificance in our attempts to do God’s work? We are merely his hands and feet, we must do as he tells us and he will provide. Place yourself in this revealing work of art; pray, listen and “do whatever he tells you” (John 2:5). 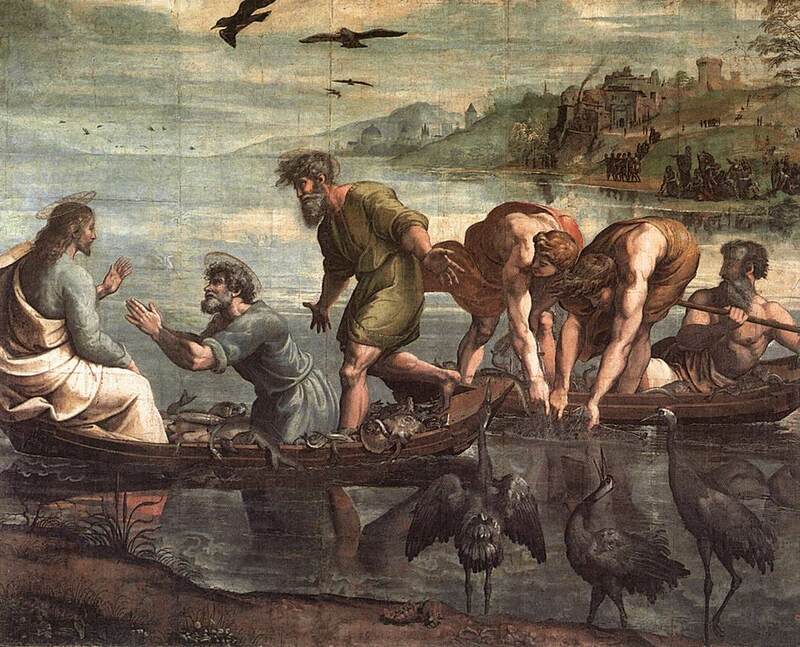 Cast out your nets to the deep with complete trust that God will send us faithful and willing catechists. Pray, listen and as Jesus said to Simon in the Gospel of the miraculous draught, “do not be afraid; henceforth you will be catching men” (Luke 5:10). God does provide as we trust and follow his directives. We hope you enjoyed this post. More importantly, we want to continue the conversation – please add your comments and let us know what works for you! While many folks participated in providing ideas for this article, special thanks to Angela Gaetano (Phoenix), Julie Schoonover (Chicagoland), and Patrice Spirou (Atlanta) for their help and contributions. The Ignatius Press Religious Education blog will begin regular updating next week! Please check back or sign up for updates to keep up with the latest.